Fritha, Gabriel, Gwen, Lilly, Louise, Robbie and Claire (for the last hour) met at Robbie and Claire’s. We planned the sauna show, began the review of AltMFA and began filling up the next 3 months of sessions. Notes for each follow and end with some of the action points we need to follow up with. Email any other points to Robbie and he’ll collate it all to spare millions of emails to everyone. We listened to the sounds we had recorded last week of some of us talking about what AltMFA is to us. These are to be edited for a sound installation on a simple headphone setup. 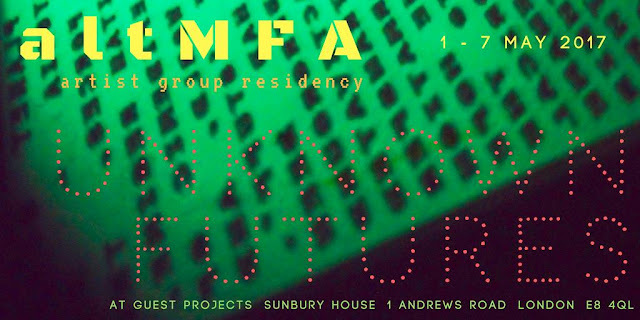 If you weren’t here last week and wish to email a talking contribution about AltMFA to you, email Robbie ASAP – Neela said she’d like to so yes that’s good please. Shelf for things for the space 2x2metres – Anyone who’d like to contribute to the material on the shelf and can either bring it or organise one of us to print/collect etc it can go on the shelf too. Gabriel has Steph’s books, Gwen has a suitcase – email articles we have used if you think it should be in the space. Whoever can make it there will organise the objects etc. Contact Louise, Fritha, Gwen and/or Gabriel if you’d like them to add your choices. Continue the review/planning the next 3 months. Meeting at Sauna Gallery TBC by Louise, please email any potential speakers/new members/subjects and pick a Monday as we’ll be trying to plan the next 3 months.